One aspect of traditional Maasai culture that remains central to the passage from boyhood to manhood is circumcision. It is a physical and psychological ordeal that Maasai boys look forward to and also dread. This remarkable ethnographic documentary explores the complex meanings of masculinity and Maasai ethnicity, and the place of circumcision and its attendant rituals in their cultural construction. For the Maasai, circumcision is a key public celebration of manhood. The principal events that surround and take place in a Maasai circumcision are shown in detail, including an actual surgery. The surgery itself is remarkably different from that familiar to Western peoples; the cutting is as intricate as the Maasai notion of masculinity. Important commentary is provided by David Kampatae ole Oinyeyie, an unmarried junior elder, who discusses the experiences of Maasai boys that grow their courage until they are ready for the ultimate test of the knife. 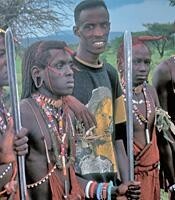 A Maasai man, he says, must be fearless and always ready to confront danger in whatever form it may present itself. Whether it be the teeth of a leopard or the knife of the circumciser, a Maasai man is ever-ready to face danger without complaint. Proud of his culture and its traditions, David also acknowledges that Maasai life is changing as Western life influences tastes, desires, and practices. The Maasai way of dress, although less desirable in some contexts than Western clothes, is more suited to the environment of the pastoralist way of life, but young Maasai in particular prefer shirts and slacks to shukas. This is the second in a developing series of films (see also Womanhood and Circumcision: Three Maasai Women Have Their Say) on culture change among the Maasai of Kenya at the end of the 20th century. The two films together illustrate the important differences between the contexts of male and female genital-cutting among the Maasai. Boys are altered outside in public, surrounded by dozens of their age mates who taunt and goad them to avoid the disgrace of expressing hesitation or pain. Girls are cut inside their mother’s house, in privacy, surrounded by only four women who whisper encouragement. Women initiates stand and walk to the bed where they will rest and heal; men are carried. These differences are iconic of the distinctions that will differentiate Maasai women and men from this point forward in their lives. The films clearly demonstrate how the Maasai divide life into stages that mark the progression from child to elder. While females pass directly from initiate to woman, males must be tested again and again: attaining adult manhood is a complex process that challenges and changes both body and mind. This outstanding documentary will engage students and generate analysis and discussion in a variety of courses in cultural anthropology, African studies, and gender studies. It was produced by Barbara G. Hoffman, Associate Prof. of Anthropology and Director, Visual Anthropology Center, Cleveland State University. The DVD version of the film is fully authored by Prof. Hoffman, and includes menus, chapters, and scene previews.